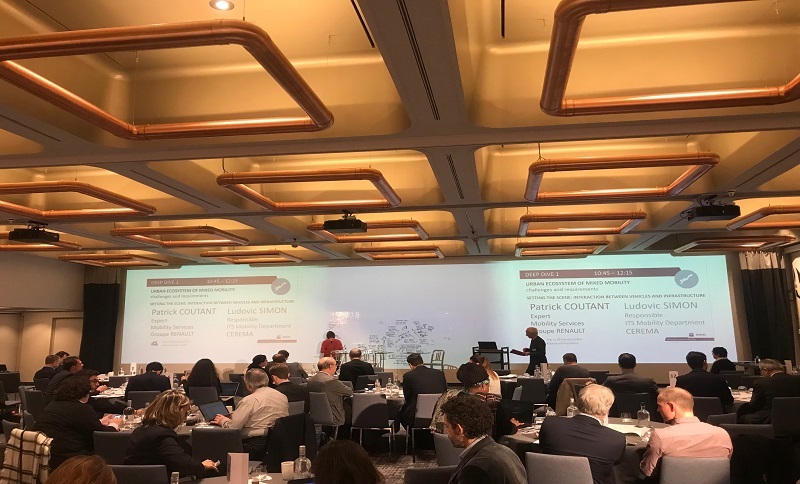 The European Committee for Standartization (CEN) and the European Committee for Electrotechnical Standartization (CENELEC) jointly organised a one-day stakeholder workshop entitled “Urban Autonomous Mobility: what role for standards?” ARCADE was present with a stand and several partners participating in the panels. Experts from the CAD and standartization community met on 21 November at NH Hotel Bloom in Brussels to discuss and identify gaps for standards related to automated urban mobility. The Connected and Automated Driving Initiative was invited to have a stand at the exhibition area in order to answer questions about the just launched EU project ARCADE (Aligning Research & Innovation for Connected and Automated Driving in Europe). The stand was the perfect opportunity to disseminate relevant information about ARCADE among an expert community. ARCADE shared the exhibition area with SAFE TRIP, STAND ICT and UITP. After Vice-President of CEN Ruggero Lensi welcomed attendees to the workshop, the event kicked off with keynotes from UITP and our partners ERTICO on the topic of the ecosystem of urban autonomous mobility. Johanna Tzanidaki from ERTICO underlined how her company is working to identify the needs and gaps for standards through its working groups and innovation projects (ARCADE, MaaS Alliance, SAFE TRIP…). Several other ARCADE partners were involved in the discussion panel: Renault talking about the interaction between infrastructure and vehicles and overall standartization priorities and Bosch and CLEPA discussing challenges and requirements for an urban ecosystem of mixed mobility.